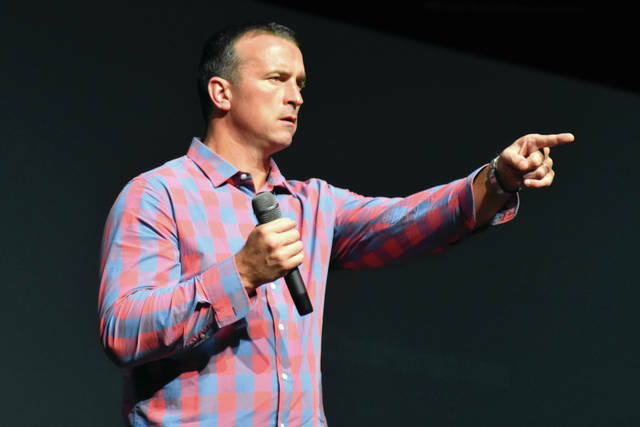 Cody Willoughby | Troy Daily News Former NBA player Chris Herren discusses the dangers of drug addiction with Miami County area students during “Rebound: The Chris Herren Story” on Thursday at Hobart Arena. TROY — Thousands of Miami County students experienced the real-life testimony of former NBA player Chris Herren on Thursday during “Rebound: The Chris Herren Story,” a special presentation at Hobart Arena. The program was presented in two installments to local junior high and high-schoolers, followed by a third evening installment open to the public. During the program, Herren shared his story, beginning with high school basketball stardom in his hometown of Fall River, Mass. Herren realized a lifelong dream of playing for the NBA when he was drafted by the Denver Nuggets in 1999, and was traded to the Boston Celtics after his rookie season. His professional career was lost, however, when a history of substance abuse caused a series of overdoses and felony charges. Alcohol and drug-free since Aug. 1, 2008, Herren has refocused his life to prioritize his sobriety and family. He now engages in approximately 250 student and large-group presentations every year to share his experience in the hopes of “reaching at least one person” to continue making a difference. The program was presented through a partnership between Troy City Schools and Premier Health. For more on Herren’s outreach, visit www.theherrenproject.org. https://www.dailycall.com/wp-content/uploads/sites/30/2018/09/web1_Herren1.jpgCody Willoughby | Troy Daily News Former NBA player Chris Herren discusses the dangers of drug addiction with Miami County area students during “Rebound: The Chris Herren Story” on Thursday at Hobart Arena.